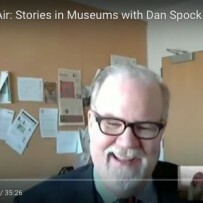 Yesterday Mary Maher, editor of the Association of Children’s Museums publication Hand to Hand and I had a fun Hangout with Dan Spock, Director of the Minnesota History Center Museum and all around museum innovator. We’re using the Hangout to generate content for an issue of Hand to Hand coming out in May focusing on uses of stories as a way of connecting with visitors. I’ll post the video of the hangout below — it’s about half an hour long. Apologies ahead of time for the extreme reverb on my microphone. (Also I’ll shave next time and will sit further back from the camera. Lessons learned). One point that sticks out to me after the conversation with Dan — the power of designing environments that have an “affordance for storytelling”. Art museums: how is artwork woven through a person’s life?